Imagine it's morning or early afternoon, and suddenly you get a craving for a breakfast sandwich with egg, bacon and cheese. Fast food isn't what you want -- you want to elevate the humdrum McMuffin to a gourmet level. Luckily, Cincinnati and Covington are teeming with delicious breakfast and brunch sandwiches. Most eateries refer to the item as a "breakfast sandwich," but some have more specific, creative names. Although breakfast sandwiches offered post-3 p.m. are scarce, these nine places will get you through the weekday and weekend drudgery. 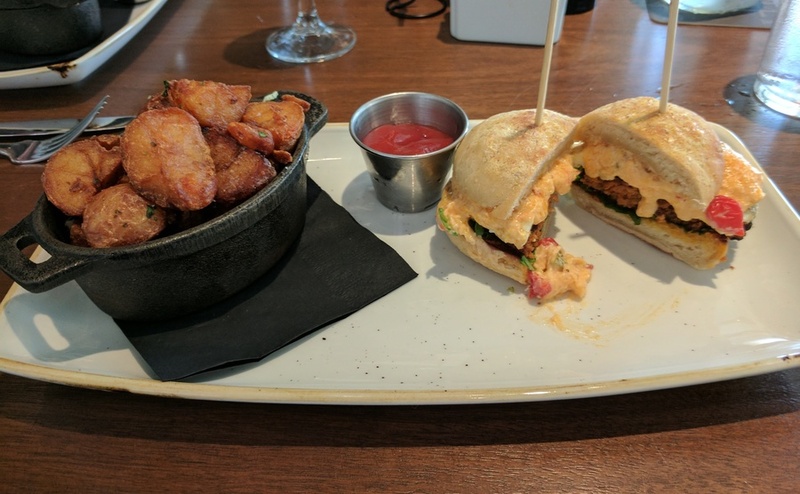 Cheapside's breakfast sandwich comes with pimento cheese. Cheapside's delicious, gooey breakfast sandwich ($7) is what inspired this list. Slabs of bacon, a fried egg over easy and melted pimento cheese are sandwiched between two slices of crusty whole-grain bread. It doesn't come with any accouterments -- its minimalistic approach is enough -- but feel free to pair it with a matcha latte or Cheapside's signature tonic and espresso beverage. The Echo's breakfast sandwich comes with a choice of bread, cheese and a side. 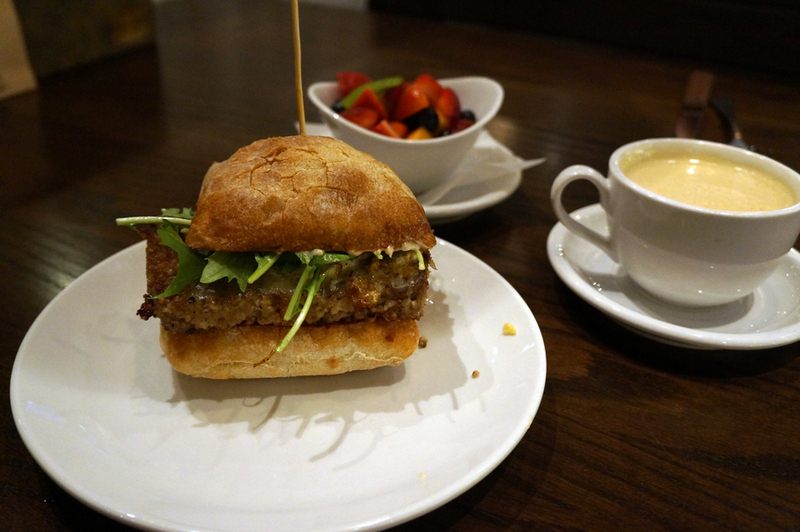 Maplewood's goetta breakfast sandwich is best enjoyed with a side of fruit and a Brainstorm coffee. Because this is Cincinnati, three-meals spot Maplewood puts goetta on its Breakfast Sandwich ($9). 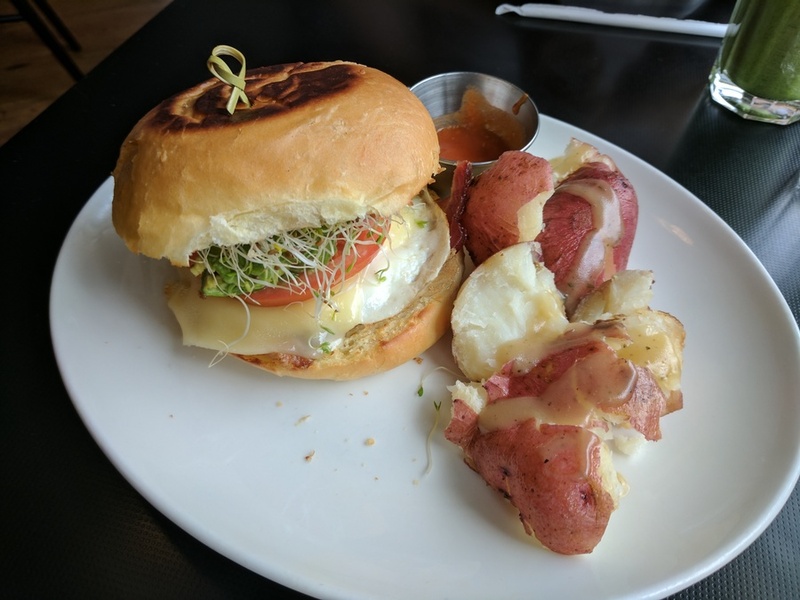 The thick sandwich -- made with Sixteen Bricks' ciabatta bun -- layers the heat with smeared spicy aioli on top and tomato jalapeno jam on the bottom. Between the buns, a fried egg, cheddar and arugula hug a hearty housemade goetta patty. The sandwich doesn't come with a side, but you can order a cup of fruit and/or a Brainstorm coffee (coffee whipped with coconut oil and grass-fed butter) for the ideal power breakfast. The sandwich is available until 3 p.m. daily at 525 Race St., Downtown. With sprouts and avocado, Sleepy Bee's Broakley sammie is somewhat healthy. Only the Oakley location offers the Broakley -- a mashup of broken yolk and Oakley -- on its menu. Clocking in at $11, it's one of the more expensive breakfast sandwiches in town, but it's also one of the healthiest. Over-the-Rhine bakery Shadeau Breads supplies the sweet brioche bread, which houses thick-cut bacon or sausage, alfalfa sprouts, a runny fried egg, melted white cheddar, red onion and tomato slices. Sleepy Bee's meats are hormone- and GMO-free, and they are usually sourced from local farms. Smashed red potatoes with a drizzled garlic-honey sauce and housemade ketchup (more savory than sweet) accompany the sandwich. At Sleepy Bee's Blue Ash location, the Blue Ash Smash is similar to the Broakley: scrambled eggs, nectar sauce (a creamy sauce with honey and cayenne), potatoes, candied bacon, pesto and pickled onions on sourdough bread. A large portion of breakfast potatoes comes with the McCoppin's breakfast sandwich. One-upping the McMuffin, the McCoppin's ($10) is a small sandwich that contains spicy pimentadew (the Coppin's version of pimento cheese), arugula and chorizo on an English muffin. The best part may be the crunchy, salty fried breakfast potatoes, served in a cast-iron dish. While you're at it, might as well order a mimosa or michelada. The McCoppin's is available every day at breakfast (until 11 a.m.) or during weekend brunch (until 2 p.m.) at 638 Madison Ave., Covington. Sugar 'n Spice's breakfast sandwich, with feta cheese folded into a scrambled egg. You can sink your teeth in at 4381 Reading Road, Paddock Hills. Add a sausage patty to Pleasantry's breakfast sandwich. Smashed avocado lies on top of the bottom portion of the lightly toasted ciabatta bread while the egg white from the runny fried egg protrudes from the sandwich. It's $3 extra to add a sausage patty and an additional $3 to add mixed greens -- the former is well worth the add-on. No sides come with the sandwich ($6), but make sure to try Pleasantry's housemade chai latte or a glass of its Deeper Roots on-tap cold brew. 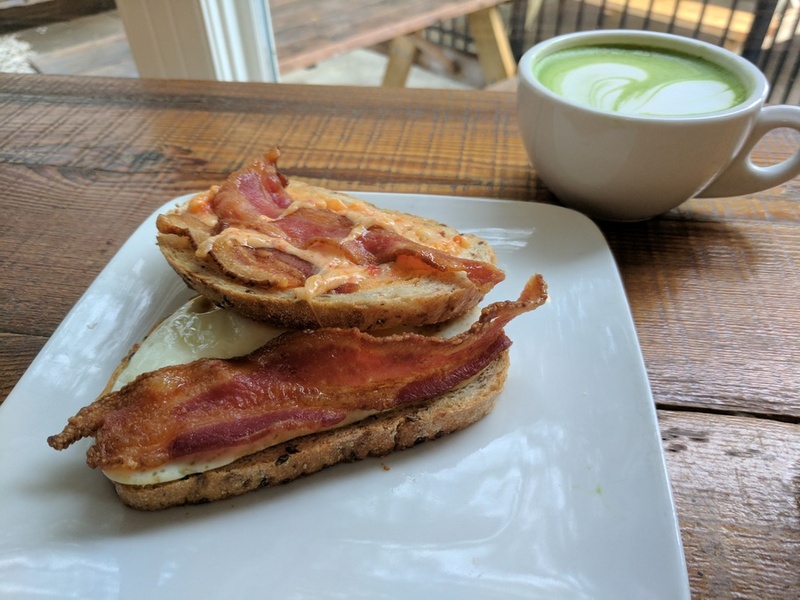 The breakfast sandwich is served during breakfast (8 a.m.-2 p.m. Tuesday-Friday) and weekend brunch at 118 W. 15th St., Over-the-Rhine. Taste of Belgium's the McWaffle: fried egg, gruyere and bacon on a waffle. What Taste of Belgium does best is waffles, so it makes sense for its breakfast sandwich to be named the McWaffle ($8.50). 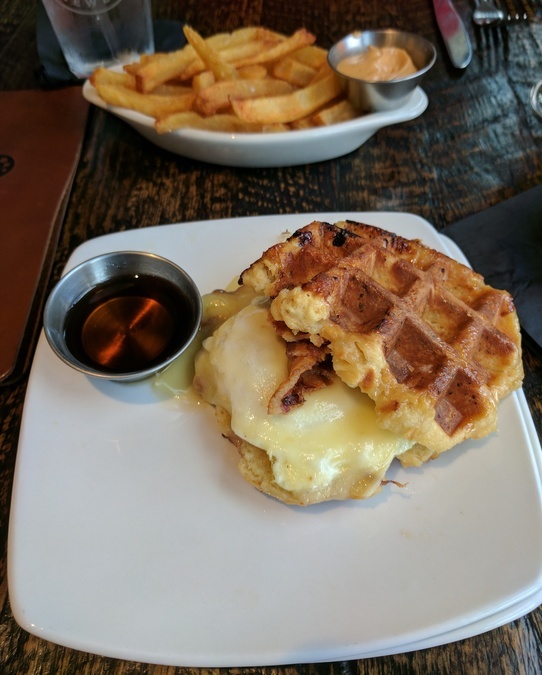 A fried egg, bacon strips and melted gruyere cheese are placed between two sweet, caramelized waffles. Ohio maple syrup comes on the side, adding to the sugary waffle flavor. For $4 more, get a side of frites and dip them into the syrup. The McWaffle is available until 11 a.m. Monday-Friday and during weekend brunch. You can even order it online and pick it up at any of Taste of Belgium's locations: 16 W. Freedom Way, Downtown; 1135 Vine St., Over-the-Rhine; 2845 Vine St., Clifton; or 3825 Edwards Road, Norwood. 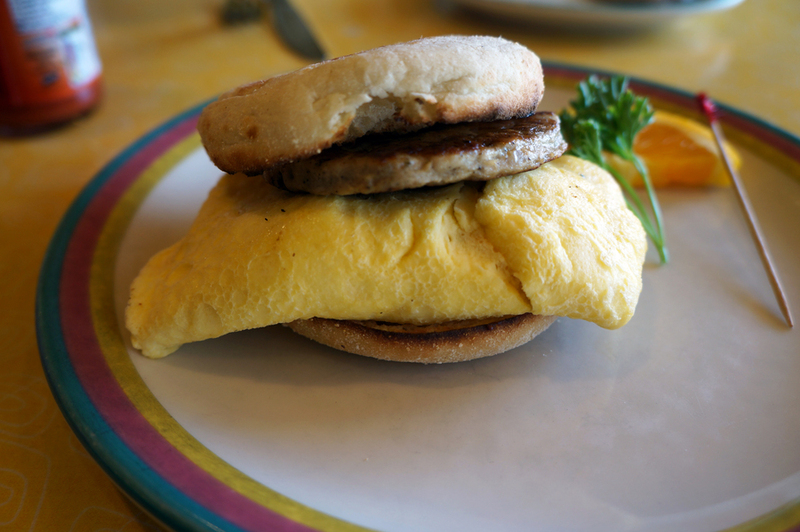 Brown Dog Cafe's breakfast sandwich comes with home fries. 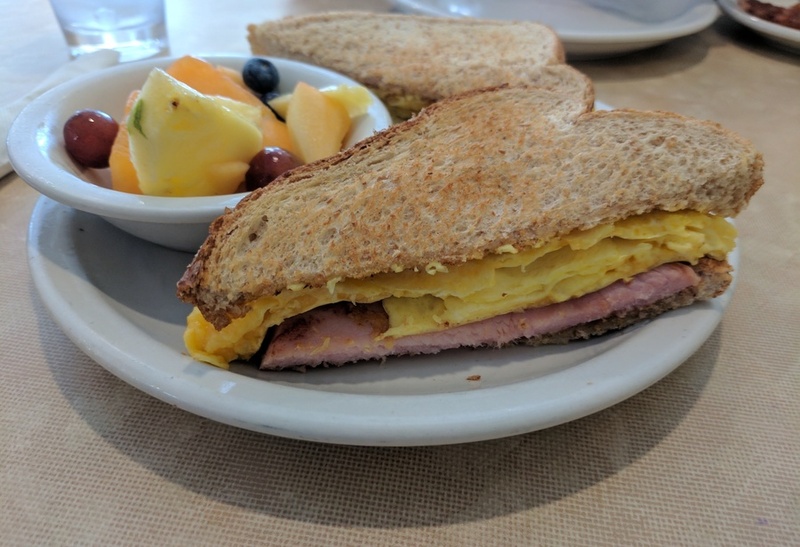 At Summit Park in Blue Ash, Brown Dog offers its Breakfast Sandwich during the week at breakfast (7:30-11 a.m.) and for Saturday and Sunday brunch (10 a.m.-3 p.m.). However, at brunch the sandwich is $13 (as opposed to $9 for breakfast), and it's served on a Blue Oven Bakery English muffin instead of a challah bun. Brown Dog folds cheddar cheese inside a cooked-through fried egg, which sits between the bread slices along with arugula, maple mayonnaise and a protein: nitrate-free bacon, ham, turkey sausage, goetta or roasted turkey. Fried potatoes mixed with tomatoes, onions and yellow peppers come as a side. Chow down at 1000 Summit Place, Blue Ash.